Security will always be a balancing act. The opposite of security is convenience, foolproof security is almost impossibly inconvenient, while simplifying it almost always leads to lower levels of security. 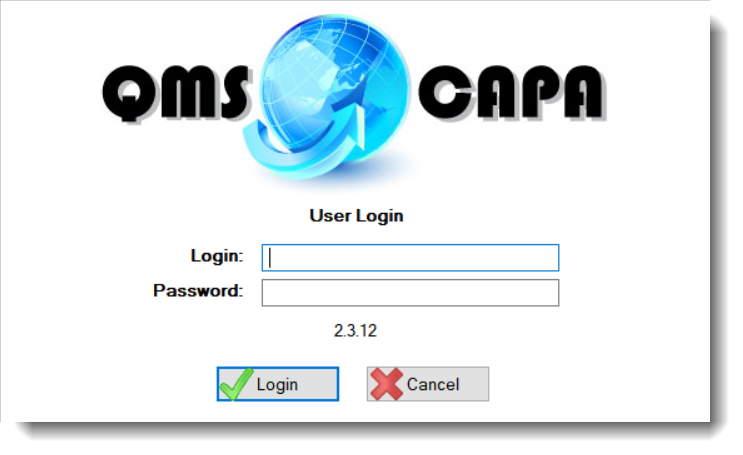 When a user is created in QMSCAPA they can be classified into one of 3 possible Levels. The level with all the power is called a Supervisor. The Level with no power (in fact they will be denied access) is called No Access. In between, where a user has potentially limited power, they are allocated a Level called Operator. The difference between a Supervisor, and an Operator is obviously a significant one. Simply put, a Supervisor is allowed to change the security access rights of other Users. An Operator can not change either their own, or anyone else's, Access rights. QMSCAPA may be distributed without its Security option enabled. When the Security option is enabled and the program is run the User is asked to enter a Login and a Password. A User's information is made up of a First Name, Last Name and Login code. When you first add a user the Password is automatically set to be the same as the Login code. After you have finished entering the first user, then you can use the Login, and Password (which will be the same at this point) to log in. Three things must be done to implement security in QMSCAPA. 1.First, set up your user groups. Take some time to organize groups of users by department or job function. 2.Second, add your users. Assign every user a Login and Password. 3.Third, define screen access levels.